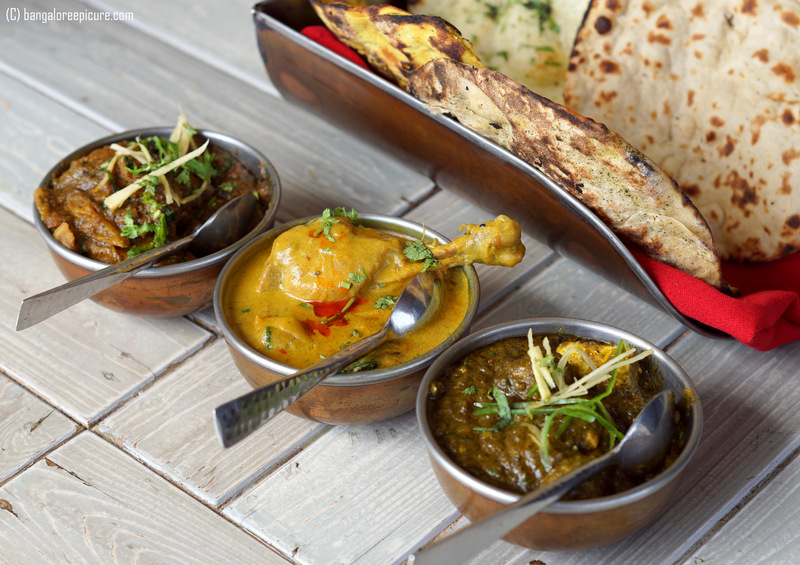 Who doesn’t love Dhaba food! I personally love to drive and stop over at some good Dhaba and relish the authentic food and relax. Last week, I got to visit “Dhaba by Claridges” – A popular venture by Azure Hospitality arrived to Namma Bengalore. The restaurant is located in renowned Indiranagar, where most of the popular eateries based. The place has typical Dhaba feel right from décor to food. One can certainly imagine how the ambiance will be! Precisely the Colorful Furniture and those quoted lines. Those Bollywood songs in the background give an exact feel. I was here for the exclusive “Chef’s Special” basically it’s a new menu with some special/new dishes introduced and added to the menu. I had been here a couple of times on my own and this was upon an invite from a venture. What’s New? Well, they have introduced the dishes like Tawa Bhindi Masala, Tawa Panner, Tandoori Bhuni Sabzi, Tandoor Ananas, Gobhi Nutri, Nutri Saag Paneer, Aloo Bhain Masala and Dhabe Da Meetha under Vegetarian fare. A bright Monday afternoon at Dhaba started with Aam Panna, it was served in typical Soda Bottle and quite refreshing. It won’t be wrong when I say that Aam Panna over here is authentic. The fried Jeera added in Aam Panna made the drink even better. While gulping Aam Panna, a plate of Joy that’s Tandoori Ananas, Tandoori Paneer and Aloo arrived on table with spicy mint chutney. I would say Tandoori Ananas was decent and felt spice level could have been even more. Tandoori Paneer was super soft, well marinated and grilled with perfection and can call it as “Best Ever” Paneer. I can strongly set a benchmark. Whereas, the Tandoori Aloo was again just decent and tastes like we get at other places! Tawa Bhindi is something everyone must try. A shallow fried dish was made along with chopped onions tasted like homemade type yet the freshness of Bhindi wasn’t lost. Thanks to Pratheek Ponnappa for recommending this dish. I moved to Main Course to try Nutri Saag Paneer and Aloo Bhain Masala along with some Indian Breads. Nutri Saag Paneer was basically made with Soya and Paneer with rich spice level. Honestly, it’s my kind of dish. The texture and taste will certainly win many hearts. Whereas Aloo Bhain Masala made with lotus stems wasn’t disappointed though. These 2 dishes were certainly added a value to say precisely for the Chef’s special or new menu. My meal will never finish without rice. So, I opted for Veg Pulao. Believe me, it’s the best pulao I had so far. It wasn’t something like regular peas and carrot kind of ones mixed with basmati rice. It was loaded with moderate masala and decent spice level. It was made like the way I want! May be, Chef understood my requirement accurately without asking. Kudos to him! An afternoon ended with Dhabe Da Meetha – It was layers of happiness! Yes, the dessert was layered with Vanila Ice Cream, Shahi Tukda, Mini Gulab Jamoon and garnished with saffron strands. The service was great and folks know their stuff perfectly. It was prompt during other visits as well. Note: This article is completely based on my personal experience and not influenced by anyone though it was an invite. Copying Pictures or Content from this article without permission is definitely not acceptable. Previous Post An Epic Food Walk at Kempegowda International Airport, Bengaluru.